Know Your Power: A Message to America’s Daughters. By Nancy Pelosi with Amy Hill Hearth. Doubleday, 180 pp., $23.95. This book has inspired toxic comments on Amazon, apparently coming both from Republicans opposed to Nancy Pelosi’s liberal politics and Democrats enraged by her refusal to support impeachment proceedings against George W. Bush. Those diatribes may be too harsh. How bad can a book be when it includes an admission by the nation’s highest-ranking elected female official that she got where she is partly by declining to ironing her husband’s shirts? 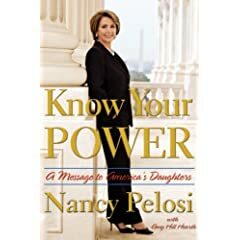 Know Your Power isn’t a definitive autobiography but a brief memoir that its publisher optimistically but rightly categorizes as “motivational.” And it would be welcome if only because it offers an alternate model to any woman who thinks she could never meet Sarah Palin’s standard of running for high office as the mother of an infant and four other children. An implicit message of Know Your Power is: You don’t have to. Pelosi gives a strong sense of the rewards of a life in politics, some learned from her father, a Congressman from Maryland and mayor of Baltimore. She also sees the comic absurdities faced by elected officials of both sexes. One fan told her, “Speaker Pelosi, I named my dog after you.” One of the strongest sections of the book deals with her remarkable mother, who raised seven children — one of whom died at the age of three — and made sacrifices that indirectly underscore the need for elected female officials of both parties. Some of the nastiness in politics today clearly results from the problem noted by Boggs, that many elected officials fight every fight as if it were their last. It’s easier to take an end-justifies-the-means view if you think you’ll never face your opponent — or American voters — again. Partly for that reason, if Know Your Power is billed as a book for “America’s Daughters,” it has a message for American’s sons, too. Best line: On why she majored in history at Trinity College in Washington. D.C.: “I had intended to major in political science, but at Trinity at that time you had to major in history in order to study political science. Our teachers often quoted the great English historian J.R. Seeley’s aphorism: History without political science has no fruit. Political science without history has no root.” As someone who majored in political science major, I think Trinity had it right here. I had good poli sci professors but almost no history courses, which left me with an inadequate context for some of their lessons. If I had it to do over, I would major in history or English, which might have required me to take a few Shakespeare courses. I thought I had enough Shakespeare partly because I’d had a wonderful introduction to his greatest plays in high school. Wrong. You never have enough Shakespeare, especially if you’re a writer. Worst lines: “This is an historic moment …” “This was a historic day in our house.” Pelosi apparently can’t decide whether its “an historic” or “a historic” and is hedging her bets. “A historic” is correct. To oversimplify: “An historic” dates to the early English settlers of our continent, many of whom dropped the “h” at the beginning of words, and the construction perpetuates the outdated language. Recommendation? Know Your Power has crossover appeal. Doubleday has packaged it as a book for adults, and in bookstores and libraries, you’ll find it with the new adult nonfiction. But this book may especially appeal to teenage girls, including college students, who are hoping to go into public service. Reading group guide: Doubleday has posted one at doubleday.com/2008/07/28/know-your-power-by-nancy-pelosi/, but this is a guide that’s almost worse than none. Sample questions: ” What roles do women occupy, or have they occupied, in your family? Did you have older female relatives who worked while raising a family?” These questions do not engage the serious issues Pelosi raises. You could ask them about almost any book by any female author from Edith Wharton to Toni Morrison. Furthermore: Pelosi represents California’s 8th Congressional District, which includes much of San Francisco. She became Speaker of the House in January 2007 www.house.gov/pelosi/biography/bio.html. More than seven years have passed since the arrival of Eden Ross Lipson’s The New York Times Parent’s Guide to the Best Books for Children: Third Edition: Fully Revised and Updated (Three Rivers, $18.95, paperback) www.randomhouse.com/catalog/display.pperl/9780812930184.html. This means that it omits many of the most admired books of the decade, including all the 21st-century Newbery and Caldecott medal–winners. But it’s still so much better than most books in its category that it’s one of my favorite baby gifts for parents who are serious readers.